The new Saturday Brunch at Indigo definitely should to be on your radar. Why? It is not your ordinary, all-you-can-eat buffet overflowing with luxurious food that we have become accustomed to here in the UAE. You won’t be dishing up Chicken Tikka or Dal that has been sitting under a heat lamp for the past hour. Indigo has a different but unique concept of brunch. There is no buffet on display. Instead you will be served the dishes in small portions to your table. The food is made fresh to ensure the best flavour. Don’t worry – it is still all you can eat (and all you can drink) and the when it comes to taste – Indigo delivers. To be honest I don’t really know much about Indian food. Sure I have had the usual Indian picks – Samosas, Naan bread, Butter Chicken etc, but my knowledge is quite limited. You won’t find me whipping up Chicken Biryani in the kitchen (because I don’t know how). 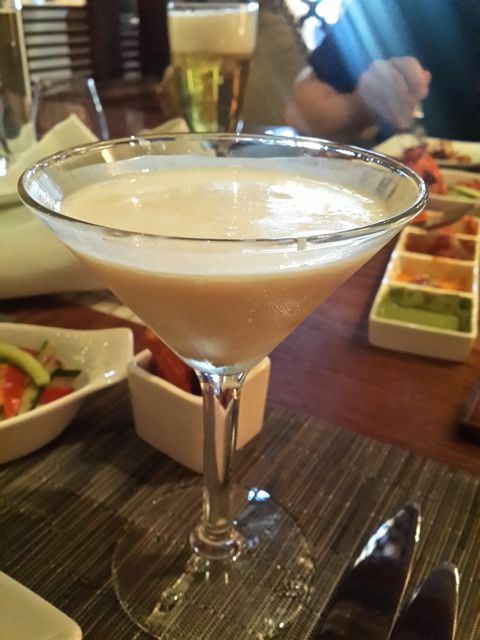 Indigo is a great place to expand your tastebuds and discover new dishes. Prior knowledge about the cuisine is not necessary. The staff are proficient and will explain everything to you. Chai – I love Chai. This is one drink that I would love to learn how to make at home. I now know that it is not too difficult to make. How do I know that? Well I watched Nabir – the tea man – make 100 mile ki Chai right in front of us and it only took moments. The 100 mile ki Chai is a favourite in India. Made with ginger, fennel, loose chai, cardamon and milk, we watched the steam fill the air as it was poured back and forth between two hot teapots to break the fat in the milk. This is what makes the Chai creamy. It is poured into traditional Indian tea glasses but not to the top. This is called cutting glass – which is the tradition of filling only halfway to ensure there is enough for everyone. I mentioned above that I love Chai. When I was offered a Chaitini there was no way I was going to say no. Creamy chilled chai mixed with cream and vodka, it reminded me a bit of a White Russian (sans ice) but with spice. Tastebuds already tantalised. The menu at Indigo is divided into 3 sections: Small Bites, Big Bites, and Side Bites. 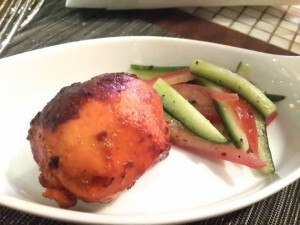 It also includes a selection of Must Haves which are traditional Indian breakfast food – the kind of food made by mama. You won’t find this kind of food in the restaurants. You are given a pen to tick your first options on the menu. The server will take the card away to the kitchen but don’t worry if you didn’t select everything the first time around. You can ask for another menu if there is something that you want to try later on. We were served a selection of poppadoms and chutneys to eat whilst we viewed the menu and sipped on our Chaitinis. You don’t have to be a food critic to know fresh flavour when you taste it. The first thing I tried was the Mint Chutney. WOW! It was fresh, smooth, minty, spicy but not too spicy. My chutneys were gone before we made our first selections. A bit embarrassing but the waiter knew to bring some more chutneys over as soon as the first dish was gone. Now that is great service! Each of the portions are served in little dishes for you to try. What is great about this method is that you are more inclined to select new dishes you have not tried before. The manager, Shipra, was awesome when it came to selecting food. Her knowledge was impressive. She livened up our meal with little anecdotes about the dishes and gave useful recommendations. During the meal Chef Nittin Raheja came out to explain the preparation of the dishes and what regions the dishes are from. Most dishes are from the North but there are a few from the southern region. Such a mixture of intense flavours and spices, the food was amazing. Some of the food was fiery hot but not so much that it took away from the other flavours. It was never uncomfortably spicy. From start to finish each course held a bit of excitement wondering how the next dish would taste. By the end of our 3rd course we were absolutely stuffed. There was no way we could go back for seconds. We had to take a tea break and have some more 100 Mile Ki Chai before finishing off with some dessert. How could we fit in dessert? I don’t know. I only said Yes because I knew it was only going to be a small portion…and it’s dessert! So this is how we broke our meal up – We started with Small Bites. Instead of going for the Big Bites second we selected some of the Must Haves. We had to try some of mama’s favourites before our bellies filled up. We then moved onto the Big Bites which we slowly worked our way through. We finished off with dessert. The menu has a great selection, you’ll want to try everything at once. From crisp potato and cashew nut patties, chicken tikka to Bombay Keema Pao. Dishes with unfamiliar names like Chandi Chowk ke Cholle Poori and Tandoori Aloo Parantha will have you hemming and hawing over whether or not to try it. Go for it! I did (Thanks to Shipra). Who knew yogurt and a tangy pickle sauce would taste so good together? Each dish has its own distinct taste – all equally delicious. So if you are looking for something a bit different, head on down to the Saturday brunch at Indigo. 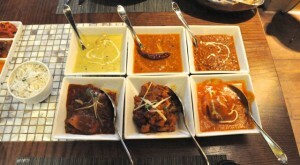 There is nowhere else in town where you are be able to explore so many different Indian dishes at one time. Start planning to meet up with your friends, bring out of towners, or just you and your partner. Hopefully you will run into Shipra, Chef Nittin, or even the tea man. If your lucky, you’ll hear the tale of 100 Mile ki Chai. Indigo is located at Beach Rotana. Brunch is served from 12:30 – 3:30. For reservations please call 02 697 9011.